On Sunday 17 January the Bishop of Richborough, The Rt. Revd. 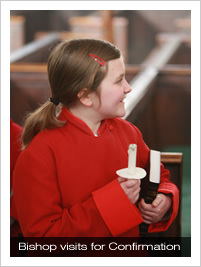 Keith Newton SSC, confirmed fourteen new members of our Church, including three girl choristers (one of whom is picture here with her Candle and Bible) and five boy choristers, at our Solemn Choral Eucharist. The combined choirs of over seventy Boys, Girls and Men sang two of our commissions, the celebratory eight-part a capella "Ecce sacerdos Magnus" by Ian Colson and the double-organ Missa Omnes Sancti by Malcolm Archer. In addition to these two commissions they performed Jack Ossewaarde's intimate motet "Draw us in the Spirit's tether" and Carl Rütti's gospel-inspired and rhythmically infectious "Tomorrow shall be my dancing day". With just short of three hundred in attendance this was a great celebration of our Parish, thriving even during interregnum. At Evensong a great contrast was drawn with only the sixteen Lay Clerks and Choral Scholars singing, offering music from the other end of the spectrum - an anonymous fourteenth cenutry hocketing motet - "Epiphaniam Domino". Prayers were offered at the beginning of this week of Christian Unity, as they were throughout the week. Today, along with the rest of the world, we kept Holocaust Memorial Day with special prayers at Matins and the Eucharist, and a specially devised Evensong including a setting of Psalm 137 and "O rest in the Lord" from Mendelssohn's "Elijah".